Join Gateway owner, Jan Acorn, on an exotic cultural and culinary journey through India’s rich northern region. This women-only tour contrasts old and new in the city of Delhi, while shopping the bountiful bazaars complete with flavorful spices, silver, perfume and traditional clothing. Amber Fort allows travelers to experience the hands-on interworking of an elephant sanctuary, while learning the importance people have in contributing to their survival. The cities of Agra and Lucknow boast deep architectural histories starting with a trip to the majestic Taj Mahal. Master the art of preparing an authentic Awadhi meal along side an expert while learning the history of its gastronomy. 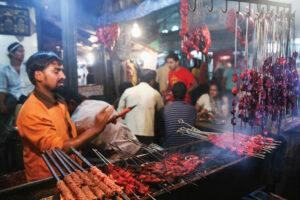 The sheer diversity of cuisines has transformed this magnificent country into a sensory haven for food lovers. Even though Indian spices are the essence of Indian dishes, there are exciting other elements that play a vital role in making Indian cuisines popular worldwide.